The complete daily food supplement for hard-working bodies who cannot miss a beat. Designed for athletes and military personnel who need maximum support for high intensity activity. 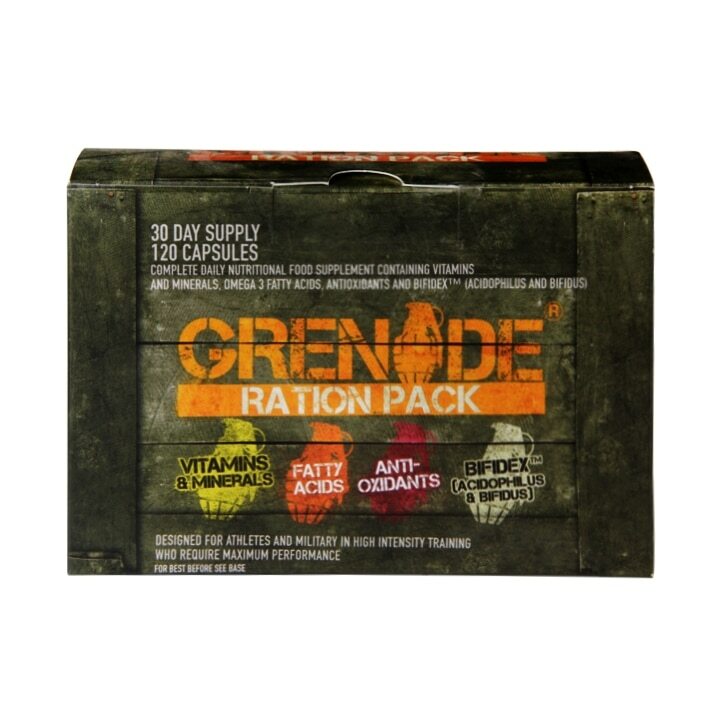 Grenade Ration Pack is an all-round daily food supplement, designed to provide comprehensive nutritional support to hard-working bodies. Ration Pack provides optimal ratios and dosages of quality vitamins, minerals, trace elements, phytonutrients, essential fatty acids and friendly bacteria. You must be 18 years or older to purchase this product. Directions for use: Adults: Take one pack per day with a meal and sufficient water or as directed by your healthcare practitioner. Each pack contains the following : Two Multivitamins + Antioxidant tablets, one Essential Fatty Acid softgel capsule, one Probiotic hard shell capsule and one BCAA tablet. Ingredients: Bulking Agent: Dicalcium Phosphate, Calcium Carbonate, Calcium Carbonate, Magnesium Ascorbate, Calcium Pantothenate, Choline Bitartrate, D-Alpha Tocopherol, Calcium Citrate, Ascorbic Acid, Potassium Citrate, Silicon Dioxide, Coating: (Hydroxypropyl Methyl cellulose, Colours: Titanium Dioxide, Riboflavin, Glycerin);, Ferrous Fumarate, Magnesium Oxide, Nicotinamide, Zinc Citrate, Acacia Gum;, Manganese ascorbate, L-Selenomethionine, Thiamine Hydrochloride, Pyridoxine Hydrochloride, Croscarmellose Sodium, Boron Citrate, Riboflavin, Copper Gluconate, Retinyl Acetate, Inositol, Cholecalciferol, Phylloquinone, Chromium Picolinate, Hydroxycobalamin, Biotin, Folic Acid, Potassium Iodide, Sodium Molybdate, Modified maize starch Corn Oil;, Antioxidant: Dl-Alpha Tocopherol;, Hydroxypropyl Methylcellulose, Sugars, Triglycerides of middle chain fatty acids. Ingredients: Fish oil from sardine and anchovy, Capsule shell: Fish gelatin, Glycerol; sweet orange oil, Antioxidants: Natural Mixed Tocopherols, D-Alpha Tocopherol. Ingredients: Bulking agents: Microcrystalline cellulose, Dicalcium Phosphate, Ascorbic Acid, N-Acetyl Cysteine, Lutein Esters 5% Freeze Dried, D-alpha tocopheryl extract, Bilberry Powdered extract 4:1, Alpha Lipoic Acid, Coenzyme Q10, Green Tea Standardised extract, Silicon Dioxide, Coating (Hydroxypropyl Methyl Cellulose, Glycerin), Colours: Titanium dioxide, Beetroot red, Beta Carotene, Quercetin, Blackberry Powdered 4:1 extract, Blackcurrant Powdered 4:1 extract, Sweet cherry powdered 4:1 extract, Acacia Gum, Watercress, Lycopene 10%, Stabiliser: Croscarmellose sodium;, Pomegranite standardised extract, Grapeskin standardised extract, Pycnogenol™ Pine Bark extract, Natural Mixed Carotenoids, Folic Acid, Modified maize starch, Antioxidant: DLAlpha tocopherol;, Rice Powder, Olive Oil, Antioxidant: Ascorbyl palmitate, Natural Mixed Tocopherols, Sunflower Oil, Potato Maltodextrin, Cellulose, Acidity regulator: Citric acid, Hydroxypropyl methyl cellulose. Ingredients: Calcium Carbonate, Magnesium Oxide, Capsule shell: Hydroxypropyl methyl cellulose, Glycerol Esters, Lactobacillus Acidophilus, Silica, Bifidobacterium Bifidum, Bifidobacterium animalis subsp. Lactis, Modified maize starch. Do not exceed the daily recommended dose. If you are experiencing nausea, fever, vomiting, bloody diarrhea or severe abdominal pain; or if you have an immune - comprised condition Do not use. If symptoms of digestive upset occur, worsen or persist beyond 3 days, discontinue use and consult your healthcare practitioner. If you are pregnant or breast feeding; if you have diabetes or an iron deficiency; or if you have a liver disorder or develop symptoms of liver trouble, consult your healthcare practitioner prior to use. If you are taking blood pressure medication or blood thinners, consult your healthcare practitioner prior to use. Food Supplements should not be used as a substitute for a varied diet. This product is to be used in conjunction with a sensible diet and exercise programme for best results. This product is not intended to diagnose, cure or prevent disease.